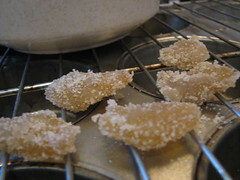 I’ve always loved using crystallized ginger but for some reason avoid buying it at the store. It’s ridiculously expensive so I don’t end up using it as much as I want to in my baking. When I was in Peru I really wanted to have some, but it was unavailable. People didn’t even know what it was. A sweet storekeeper was interested in what I was going to do with it, so she gave me a bunch of ginger for free and I promised to bring her back some crystallized ginger. I only saw it grated into soups while I was there, so I felt like a messenger, bringing the good news of kion confitado. Sadly, Maria didn’t like it but I had to hide it from the 3 year old grandson of the family we were staying at. He was addicted to it and it came out so intense that I couldn’t eat it just plain. He, on the other hand, could eat a fistful. It is easy to make and if you have the time, I suggest you give it a try. You don’t need any fancy equipment, just a pan and sugar and something to dry it on (I used cookie cooling racks). You might want to also know that ginger is good for digestion, helps with colds and sore throats, and it’s been linked to lowering cholesterol and relieving arthritis pain. And it tastes great so get to it! I like to put crystallized ginger in muffins. 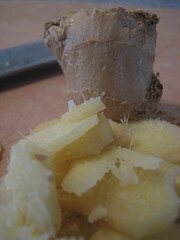 Peel and slice ginger. Set aside. Add ginger slices and reduce heat to a simmer. Simmer 30-45 minutes, or until the ginger is tender (bite it! but don’t burn yourself). Drain ginger on a rack of sorts for 15-20 minutes. 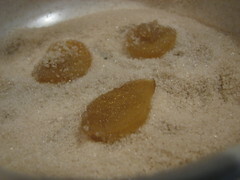 Put the sugar in a shallow bowl and toss ginger slices in sugar, coating thoroughly. Dry on rack or wax paper. Once dry and hardened (a few hours or overnight), store in an airtight container indefinitely. 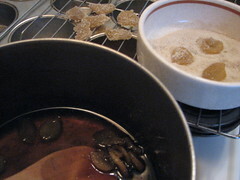 With your leftover sugar water in the saucepan, continue to simmer until it become syrupy, but not as thick as honey. Store in an airtight container in the refrigerator for…I’m not sure. It’s never gone bad on me. Note: If the syrup crystallizes in the fridge just heat up and add some more water to it. This is a great blog post, I located your blog site researching google for a related theme and came to this. I couldnt come across to much alternative information and facts on this posting, so it was great to locate this one. I likely will be back to check out some other articles that you have another time. apparently, if you put lemon slices in while simmering the ginger pieces, the syrup is less likely to crystallize, plus, you’ll get candied lemon slices as well!